Screenzone uses place-based media for promoting movies in shopping malls, reaching a highly desirable target demographic. 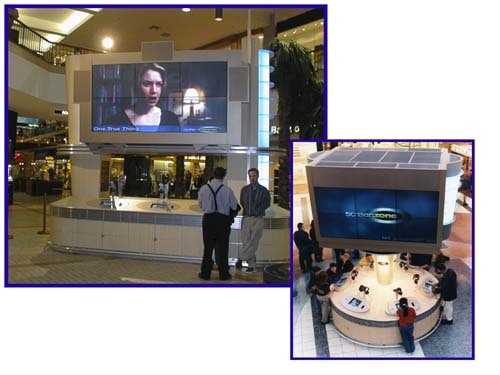 Large (6 ft x 12 ft), back-to-back multi-screen video display walls are used to play movie trailers. Also, individual stations offer independent previews, interactive contests, and movie-related web site connections. FutureTouch has participated in application development, system integration, installation, and start-up activities. FutureTouch has also set up MPEG2 servers, and has been responsible for delivering MPEG2 trailers and play lists to the kiosks on a scheduled basis. FutureTouch has a committment to the emerging digital cinema business.